The local club runs the Düsseldorf 70 cm repeater DB0SJ for years. In southward, westward and northward direction, the repeater covers about 80 km, until into Belgium and the Netherlands. However, stations from the vicinity can dominant be heard. In eastward direction, the coverage bounds to 10-20 km, because Düsseldorf is located to the eastern border of the lower Rhine lowlands. To run the repeater involves costs the local club has to pay for. Therefore, the local club is grateful for any donation. The easiest way for this is the DARC donation account with the subject "R01, [name-of-donator], DB0SJ". Thank you. The 70 cm repeater started beeing on air in 1975. From the beginning until January 1987 Hans Nettersheim (DL8MV) was reponsible for DB0SJ, after this Helmut Wiesemann (DF7JV) took this task. In June 1993 the responsibility changed over to Burkhard John (DK5JG). From January 2007 Hans Dieter Böckenkamp (DL6EZ) was the responsible person for the opertation of the repeater. Since August 2016 Andreas Buchwald (DC4AB) stands at the licence certificate for DB0SJ. 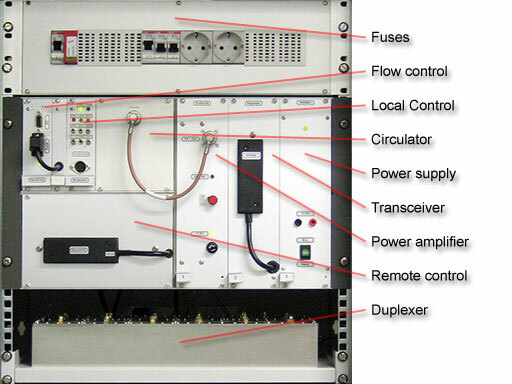 Until November 2013 the commercial repeater transceiver ICOM IC-RP4020 was in use. By a requirement of the Federal Network Agency the bandwidth has to be changed to 12.5 kHz since this time. Because a modification would be very complex the ICOM radio was put out of operation.